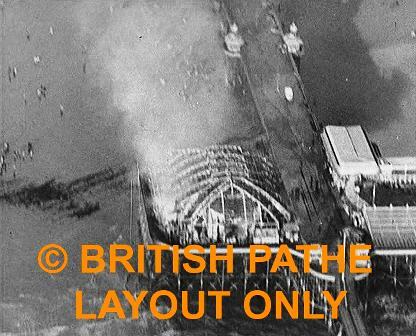 Lytham & St.Annes on the Sea Lancashire - Local History - Blackpool North Pier Fire, Pathe News, 1938. Blackpool North Pier Fire, Pathe News, 1938. North Pier Pavillion Fire, Blackpool. Aerial shots of a fire on Blackpool's North Pier. Commentator says the fire is thought to have started in the artists' dressing room at the Pavilion Theatre. A crowd of people watch from the sea front. Just the framework of the theatre remains as firemen put out the blaze with hoses. Lawrence Wright, owner of the theatre, surveys the scene of destruction with two other men. Long shot of Blackpool Tower.